"For several notable reasons this little town gives promise of remarkable development. It is the starting point of a new branch of the Southern Railway which is designated to connect this section of western North Carolina directly with Knoxville, Tennessee. The country surrounding the town is devoted largely to fruit growing and it is in the very heart of the finest apple growing region in western North Carolina. The scenery in this vicinity is rugged, picturesque and beautiful. Scarcely four miles away is Welsh Bald, approximately 5,000 feet in height; thence to the beautiful High Rocks is not more than two miles. These tower to a height of 5,200 feet. North of High Rocks, a distance of eight or nine miles, over a perfectly plain trail, are the famous Sisters Meadows, which rise to a height of 5,900 feet. "Three miles beyond Bushnell, the Railway crosses Forney Creek, practically at its confluence with the Tuckasegee River. There is located the pretty village of Forney, N.C."
Although Southern Railway's Murphy Branch was the main rail line from Asheville into western North Carolina, terminating at Murphy, N.C., several subsidiary or independent lines connected to the Murphy Branch. Southern Railway operated the Carolina & Tennessee line from Bushnell to Fontana, N.C., which the North Carolina Corporation Commission's annual report for 1912 noted was 14 miles long. Likewise, the W.M. 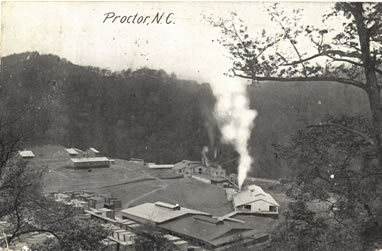 Ritter Lumber Company ran a nine mile line for its Smoky Mountain Railway from the settlement of Ritter, N.C., located near the junction of Hazel Creek and the Little Tennessee River, northeast to the town of Proctor and finally to Bone Valley. The two small rail lines converged at Ritter, allowing transit to Bushnell. With these rail links, Bushnell became the transport point for significant lumber resources. 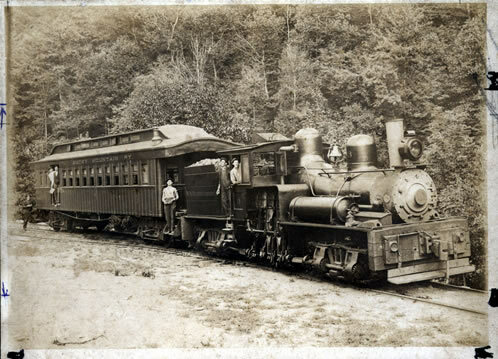 Granville Calhoun, seen at the rear of the train in this photograph, was listed in the North Carolina Year Book (1914) as the railroad agent and express agent for Proctor, N.C.
Oliver, Duane. Hazel Creek from Then til Now. [Maryville, Tenn.]: Duane Oliver, 1989.